Where are our meals? The service at this restaurant is awful. We’ve been waiting for an hour and have yet to even see a glimpse of our appetizers! Those people ordered after us and they just got their food! I’m starving! Don’t tell me to relax; I’m starting to get hangry! Eek! Sound like an all too familiar scenario? “Hanger”, the portmanteau or mash-up of the words hungry and anger describing a state of rage caused by lack of food, may actually be linked to levels of the neurotransmitter serotonin in the brain. What happens to our mood when our body is running low on glucose a.k.a. sugar? Researchers at the University of Kentucky were interested in the link between low glucose levels and aggressive behavior, so they designed a devious study to investigate the sugar-mood association. In the study, 62 college students were asked to drink lemonade containing either sugar or a sugar substitute. After drinking their randomized beverage, the students participated in a “game” where they were told that they were competing against an opponent to see who could press a button the fastest. As it turns out, the whole thing was rigged. There was no opponent just a computer. The students were set-up from the beginning to lose about 50% of the time. The loser of each round would receive a blast of white noise in their headphones. Ouch! Additionally, before each new round, the student selected the level and duration of noise their “opponent” would receive following a loss on that round. 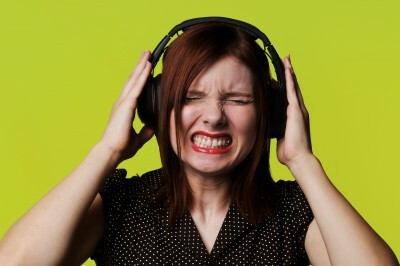 As students began receiving white-noise blasts after “losses”, they retaliated, as any frustrated person might do, and tried to return the favor to their opponent by matching the white-noise assault. Interestingly, researchers found that when students were provided with a sugar-substitute lemonade (no glucose) they were more aggressive, providing louder and longer noise blasts, than if they drank the lemonade with sugar. Feeling agitated? Have a glass with glucose and chill out! Your brain needs fuel in order to function properly. Most often this fuel comes in the form of glucose. When you go several hours without eating, your blood sugar drops. Once it falls below a certain point, glucose-sensing neurons in your ventromedial hypothalamus, a brain region involved in feeding, are notified and activated resulting in level fluctuations of several different hormones. Ghrelin, a hormone that increases expression when blood sugar gets low and stimulates appetite through actions of the hypothalamus, has been shown to block the release of the neurotransmitter serotonin. The serotonin system is incredibly complex and contributes to a number of different central nervous system functions. One of the many hats this neurotransmitter wears is modulation of emotional state, including aggression. Is your mood more difficult to control when serotonin is depleted? Potentially yes, and here’s why. In an functional magnetic resonance imaging (fMRI) study, Passamonti et al. looked at how neuronal networks involved in processing aggression were altered in subjects with low serotonin levels. Nineteen healthy participants underwent brain scans on two separate days: once after consuming a tryptophan-depleting drink and again after drinking a placebo beverage containing tryptophan. Tryptophan is an essential amino acid, found in turkey among other protein sources, that is a building block for serotonin formation. Your body does not make tryptophan on it’s own and you must get it through your diet. Don’t worry though, there’s plenty of it around! By reducing tryptophan levels, researchers were able to evaluate the effects of low serotonin levels on brain connectivity in individuals viewing angry faces. After serotonin depletion, participants were scanned to assess brain responses to images of angry, sad, and neutral faces that were presented to them. Participants were also asked to complete a personality questionnaire to evaluate their individual propensity for aggression. What did they find? 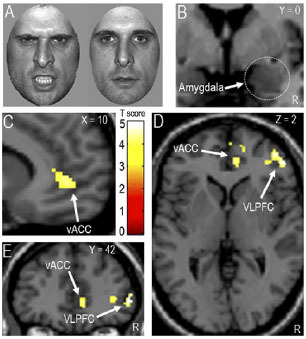 By reducing serotonin through tryptophan depletion, the connectivity between the amygdala and two prefrontal cortex regions, the ventral anterior cingulate cortex and the ventrolateral prefrontal cortex, was altered when processing angry faces but not sad or neutral faces. Additionally, when looking at individuals that were more prone to aggression based on their personality questionnaires, their brain scans revealed weaker connections between the amygdala and the prefrontal cortex. Meaning if you have a predisposition to aggression, low serotonin levels circulating in your brain may lead to altered communications between brain regions that wrangle aggressive behavior. Angry at a restaurant? Stuck in traffic? Late for dinner and feeling a Dr. Jekyll and Mr. Hyde scenario about to unfold? It may be due to serotonin messing with your brain. Grab your emergency turkey sandwich and relax. Life is going to be okay. My name is Caitlin Kirkwood. I am a PhD candidate in the Center for Neuroscience at the University of Pittsburgh School of Medicine. Like The Synaptic Scoop on Facebook! A secret to unlocking happiness? Practice gratitude. Follow The Synaptic Scoop on Twitter!